Students will learn to read once they begin school, but some parents want to know how they can give their children a head start. If this sounds like you, keep reading to learn about some ways you can help your child learn to read for free. People of all ages learn best through repetition, so it will likely be helpful if you consistently read aloud to your child every night. Instead of just reading bed time stories to help him fall asleep, read to your child while he is awake and active. While reading aloud, have him follow along in the book by looking at each word. By doing this, he will be able to see the words and hear how you pronounce them. Another way to get your child reading is to let her say words aloud. When reading familiar stories, stop and have her repeat the words after you. Taking this approach on a consistent basis will eventually help her recognize certain words, and that will help her have an easier time when learning to read. Books with lots of repeated phrases are ideal for this activity. You don't necessarily have to pay for a tutor to get someone who's able to effectively help your child read. Utilizing an older sibling or family member can help when you're unable to work with your child yourself. 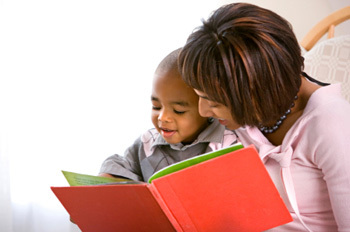 Depending on who you get to baby sit your child, you can also ask the sitter to read to and with your child. Often, the more you expose your children to reading, the quicker she'll be able to start reading herself. Therefore, it helps to attend free book readings. Writers of popular children's books will usually read their new books at local bookstores and libraries. Another benefit of attending book readings is that it helps gets your child excited about reading. When she's excited and eager about learning to read, it tends to speed up the learning process. On television, there are plenty of children's programs that focus on teaching children how to read. In fact, depending on where you live, there are channels devoted solely to early childhood education. Having your child watch these programs on a daily basis will help him learn the basics of reading. Some shows will help your child learn the alphabet and numbers. Other shows teach simple, everyday words. You can contact your local cable provider to find out about these channels or do a search on the Internet to learn more.